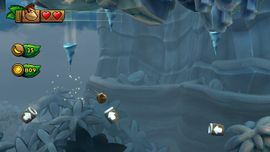 Icicle Arsenal is the second secret level of Donkey Kong Island in Donkey Kong Country: Tropical Freeze. It mainly consists of icicles that fall to hinder the Kongs' progress. It is unlocked after clearing the previous secret level Dynamite Dash, and it is one of the two only secret levels in the game not unlocked through a secret exit (the other being Rodent Ruckus). The Kongs traverse an area surrounded by icicles. The level starts with many icicles for the Kongs to avoid, along with an Archy. After smashing a bridge down, the Kongs must dash across the level to avoid the onslaught of icicles and Speedy Tucks and pull an Item Handle to climb a wall and pound a container on the right. Next, the Kongs must move across rickety platforms and evade a Fish Poker Pops to reach the first checkpoint. A series of Barrel Cannons and skull Blast Barrels follows. Afterwards, the Kongs will encounter a Boom Bird, a Fire Archy, and several Hootzes. A series of falling icicles follows, as well as a climbing wall that leads to an area with more rickety platforms and some Tucks, followed by a pair of Blue Hootzes and another Item Handle that raises more platforms, leading to the second checkpoint. After passing a Big Sphen, the Kongs must knock over three boxes with Banana Coin icons on them, then bypass the Speedy Tucks and Pointy Tucks. They must then bypass a Chum Chucker Charlie and smash an ice wall to be led to the third checkpoint. The Kongs must then climb on a ceiling, then drop an icicle and quickly move to the right while avoiding Tucks and Soaries. After climbing another ceiling, the Kongs must navigate another series of Barrel Cannons and Blast Barrels while avoiding many more icicles. After a few more Barrel Cannons, the Kongs reach the Slot Machine Barrel. K: Upon reaching the first Item Handle, the Kongs must jump onto the lower platform to obtain the letter K.
O: In the series of Barrel Cannons after the first checkpoint, in the last Barrel Cannon, the Kongs must time their launch to collect the letter O just before a giant icicle lands on them. N: Just after the first Tuffton, the Kongs must jump on a high-up Hootz to reach the letter N.
G: During the final segment with Barrel Cannons, when entering a horizontally moving Barrel Cannon, the Kongs must immediately launch to obtain the letter G before a falling piece of the ceiling blocks it. Donkey Kong and Diddy Kong fight Fish Poker Pops. The Item Handle on the ground hides a Puzzle Piece. Upon pulling the second Item Handle, the Kongs must climb to the left and pound the container to reveal the Puzzle Piece. Not long after the first Puzzle Piece, the Kongs must pick up a Partner Barrel and throw it at the Burlap Hanging Sack to the right, then collect all bananas that appear to reveal the Puzzle Piece. Just before the first checkpoint, the Kongs must pull an Item Handle to reveal the Puzzle Piece. In the segment featuring the Boom Bird and the Fire Archy, the Kongs must smash the Cracked Blocks below both enemies to lower two platforms above. Using these platforms, the Kongs must climb a wall on the left to reach a skull Blast Barrel, which in turn leads them to a Bonus Area. As with all other Bonus Areas, the Kongs must collect all bananas before time runs out to collect the Puzzle Piece. Just after pulling an Item Handle just before a pair of Hootzes, the Kongs can head to a hidden alcove on the left and collect the bananas inside to reveal the Puzzle Piece. Just after the first pair of Blue Hootzes, the Kongs must climb on the ceiling and pound a container to reveal a skull Blast Barrel that leads them to another Bonus Area. As with all other Bonus Areas, the Kongs must collect all bananas before time runs out to collect the Puzzle Piece. When reaching two symmetrically aligned climbing walls, the Kongs must sidle along the left wall as it collapses, then collect the Puzzle Piece once it comes into view. Just as DK pulls an Item Handle out of the ground to reveal a banana bunch, one icicle drops down next to him. Donkey and Diddy Kong explore an area with a fortified arc. DK bumps and collpases a stone object, causing it to bring down a massive structure. DK in an area where strong air currents raise platforms afloat. This page was last edited on August 31, 2018, at 10:32.